As part of Clean Up Australia Day on 6th March, 2016, Dera Sacha Sauda, Australia, Volunteers are providing their invaluable services towards cleanliness and helping to keep the Country clean and disease free. Such is the passion of these Volunteers towards welfare and selfless services with the motivation and guidance from Revered Master Saint Dr. Gurmeet Ram Rahim Singh Ji Insan, that these Volunteers are ever-ready to be a part of any campaign whether it is a cleanliness drive, a blood donation drive or a Tree plantation Drive. They have been always been in the forefront in providing selfless services towards the Society, and making sure that every drop of Blood is properly tendered to for the welfare of poor and needy. 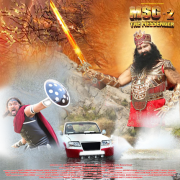 After rocking the cinemas in India, Canada, Europe, New Zealand, UAE & USA the mega Blockbuster, MSG-2 The Messenger is set to release in Australia on 30th October, amidst huge buzz. The Film will release in English dubbed version. Watch out for this record breaker, revolutionary Film in Cinemas on 30th October,2015 !